QAnon is an online cult whose members subscribe to a conspiracy theory alleging that President Donald Trump is working behind the scenes to upend a far-reaching network of pedophiles and human traffickers that, absent any evidence or credible claim, allegedly involves liberal politicians, entertainers, and business leaders. 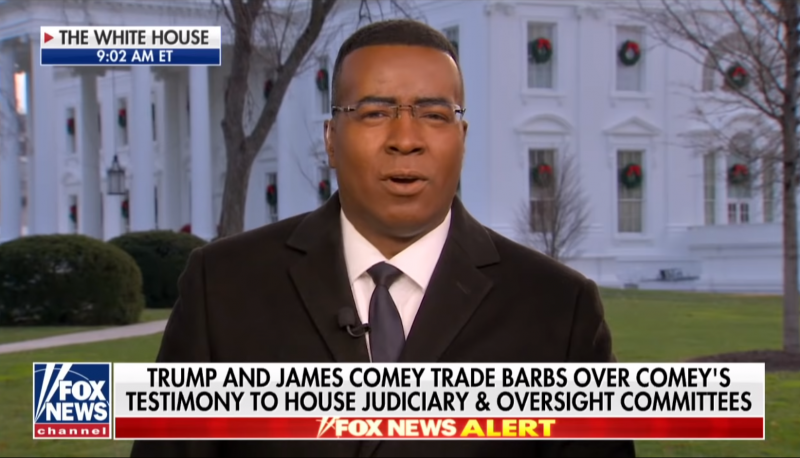 Followers believe that Special Counsel Robert Mueller’s investigation into Russian interference in the 2016 election was a cover for the secret plan, of which Trump, they say, had ordered details to be gradually revealed via cryptic riddles written by a figure known only as “Q” on the anonymous forum 8chan. 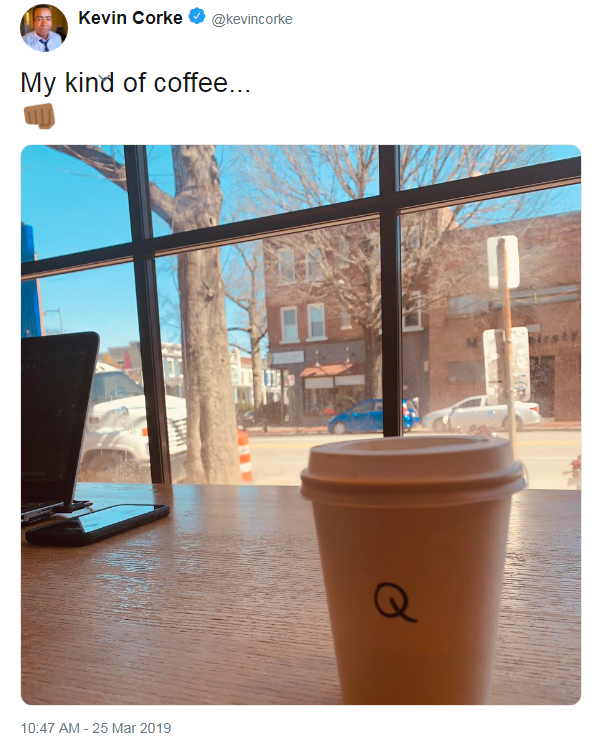 In the replies to Corke’s coffee-cup tweet, users with pro-QAnon accounts begged him to ask President Donald Trump whether QAnon is, in fact, real. QAnon believers point to the fact that reporters decline to ask the president whether their movement is legitimate as proof that reporters know in their hearts that QAnon is real. 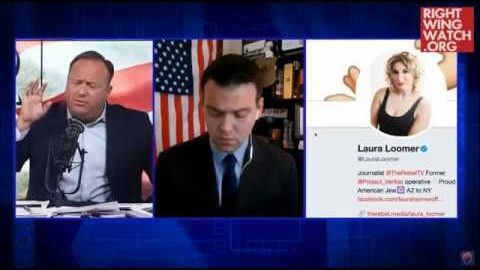 Corke also “liked” dozens of eager responses to his post that contained pro-QAnon messages. In the replies to his post, Corke sent a thumbs-up to someone appearing to acknowledge his post to be a joke. But Corke’s position as a White House correspondent for a conservative news site sort of spoiled the punchline. 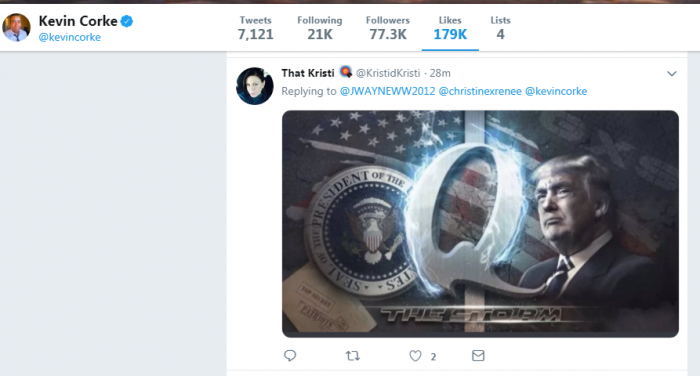 QAnon supporters have been thirsting for a drop of outside-world validation after nearly every prediction made by “Q” have failed to come true. Liz Crokin, an ardent promoter of QAnon, said that if discrepancies between reality and QAnon promises don’t resolve themselves soon that the movement’s followers might resort to “vigilante justice and that could get really dangerous.” Comet Ping Pong, the Washington restaurant at the center of a similarly styled conspiracy theory known as “Pizzagate,” has been subjected to attempted arson and attempted gun violence from people who believed the wild theory.